Have you ever been to a place so special that no words could do justice? How about a place where it's hard to fathom the beauty in which you are looking at? Whether you have or you have not, I invite you to come join me for a couple of days in one magical place, White Sands National Monument. 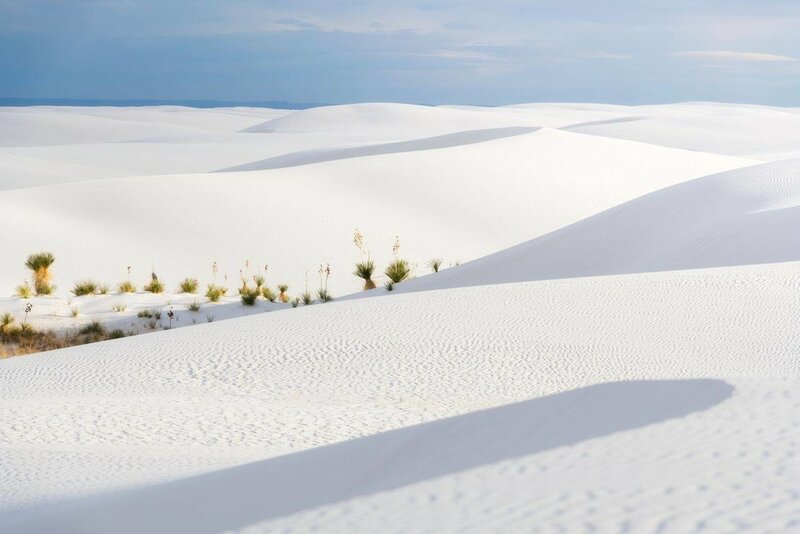 Located in southern New Mexico, this pure white gypsum dune field sparkles in the sun and has a tranquil beauty to it as stunning mountain ranges provide a dazzling backdrop. Although the dunes may not be the tallest (on average, they are about 20-40' high), their color makes up what they lack in size. Most areas of the park are quite untouched this time of year and we will work with beautiful crests, leading lines, dessert plants and more during our two days of shooting here. We will have special access to the park before and after hours so we can photograph each sunrise, sunset and also do some night sky shooting. How to create compelling landscape and night sky compositions. How to create star trails and moonlit images (weather cooperating). How to successfully light paint. How to properly dig your toes into the sand. A DSLR camera body with a wide angle lens. Note: It is also recommended to bring a zoom lens if you can! Any filters you may have. A .9 or .6 soft grad filter is recommended for your lenses. If you can only afford one, I'd go with the filter for your wide angle. Transportation to shooting locations. We can figure out carpool options at the start of our workshop. Access to White Sands National Monument before and after operating hours. We will be lodging in the town of Alamogordo, located just outside of White Sands National Monument. I will be lodging out of the Holiday Inn Express & Suites. It is not required that you stay at the same hotel, but we will be having our meet & greet here as well as leaving for any outings from here as well. In order to escape footprints from previous visitors, we may need to hike around 3/4 of a mile out into the sand dunes. This all depends on how much traffic the area has seen recently and how the winds were able to cover up tracks. There have been times after a good wind storm that you could walk 100' in and have great shots, but there have been times that I've had to cover about 3/4 of a mile before finding clear dunes. For the most part, we will walk on flat areas, but there will be times that we will have to walk up dunes. These walks will be taken at a slow and comfortable pace. The closest major airport to fly in to is El Paso. From there it's about a 90 minute drive to Alamogordo. The workshop will begin with our meet and greet at 3PM on the 14th and wrap at 10am on the 16th.